Mrs Rutter with Prince Rudy Dinah and a group of Carrolup girls. The girl second from the left is Mildred Jones. Photographer: Noel White, 31st July 1949. Noel & Lily White Collection. 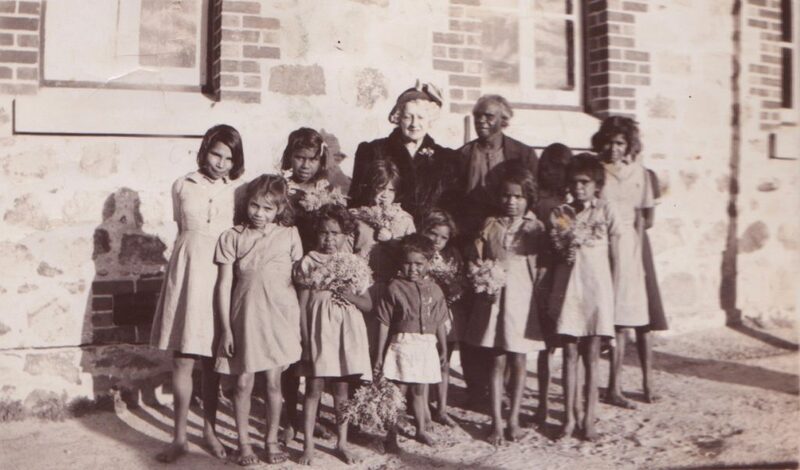 One of the aims of our project is to connect with families of the Aboriginal children who were at Carrolup. We want them to be able learn about what we have discovered about Carrolup and the people who were there – if they so wish – and hopefully connect in some way with their family member(s) who lived in the past. In some cases, we may have photographs, documents, newspaper clippings or other material related to a family member who was at Carrolup. In some cases, a person from today may be able to provide us with information about their Carrolup family member(s) or some aspect(s) of life at Carrolup. This all adds to our growing ‘Story of Stories’. If they so wish, we can post that content on to the website so that other family members and friends who might not have seen or heard that information can become more aware. Remember, our project is all about Connection. Connection to Family, Community, Culture, History, Country and Healing. We believe that Stories can be Healing. Some of you might remember my blog Keeping Up With the Jones’s. Early on in the development of this website, I described how I had been communicating with a number of different Jones’s. I continue to have conversations with some of these Jones’s, in particular Cheryle, Dale and Wazza Jones. Our Facebook pages are very useful in this regard. Recently, I posted Mrs Florence Rutter Visits Carrolup, which included a photograph of the 71-year old Englishwoman with Prince Rudy Dinah and a group of Carrolup girls on 31st July 1949. Imagine my surprise (and utter delight!) when I received a comment from Cheryle Jones on one of our Facebook pages. David. Can you find out lf my Mum ls ln this photo? Because lt looks like her front row second from left. Mildred Jones R.I.P. Now, at first I was confused because I thought Cheryle meant the girl who was second left in the front row (the little girl with the flowers) and I thought she doesn’t have a resemblance to Cheryle (from her Facebook page). While talking with John about the photograph, I suddenly realised that Cheryle was referring to the girl who was far left in front row but second left of the group. And this beautiful little girl, Mildred Jones (R.I.P), was, according to Cheryle, ten years old at the time. I can be dumb at times! Sorry, Cheryle!! 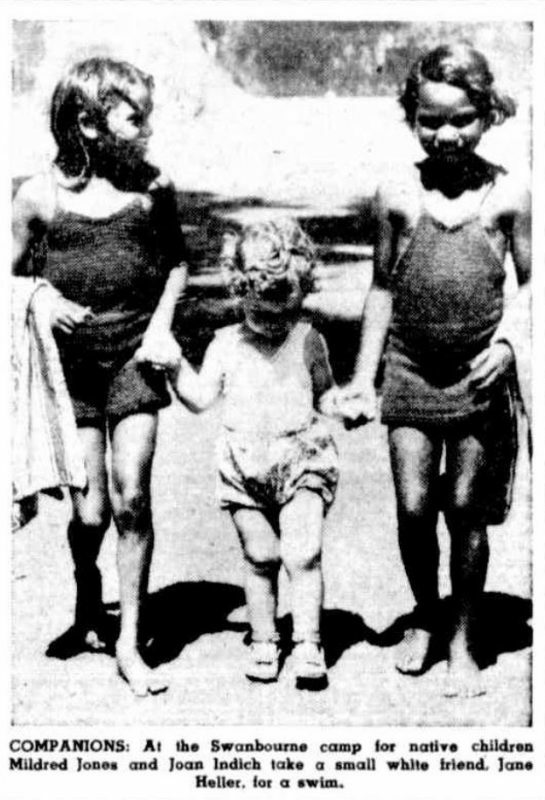 COMPANIONS: At the Swanbourne camp for native children Mildred Jones and Joan Indich take a small white friend, Jane Heller, for a swim. The West Australian, 19th January 1949. I was thrilled with this ‘connection’, the second with Cheryle’s mother, as I had earlier sent Cheryle a list of the Carrolup children who had attended the Katanning Show in November 1946, a list that included the name ‘Mildred Jones’. You can see my blog here. 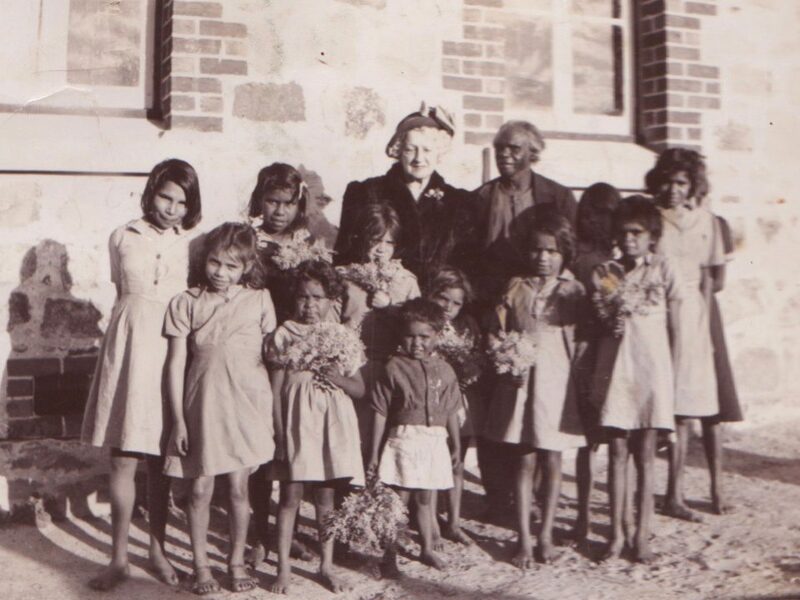 Imagine my surprise when I received a facebook message from Cheryle which contained a newspaper photograph of Mildred Jones when she was at the holiday camp at Swanbourne in January 1949. I had written a chapter on this holiday camp in our forthcoming book and had included some links to photographs I had found on Trove. However, I had missed one, which Cheryle had now sent me which appeared in The West Australian newspaper. Given all of this, I sent copies of some of Noelene White’s photographs—Noelene’s father was teacher Noel White—to see if Cheryle could spot her mother in these. No luck there. I was deeply touched by these communications with Cheryle, and the fact that her and I were visiting the Carrolup past in discussing her mother. It was a wonderful feeling to know that Cheryle had another photo of her mother, the one with Florence Rutter. And I’d love to think that the spirit of Mildred Jones (R.I.P.) is even more connected to her daughter. Cheryle have tried to arrange a first ‘real world’ meeting, but we’ve not managed to find a mutually convenient date as we are both very busy. However, we’re going to meet soon after I return (late April) from my next trip to the UK when I will visit my children and grandson. John and I are very much looking forward to that meeting with Cheryle.